A quick post as I don't know much about this film. 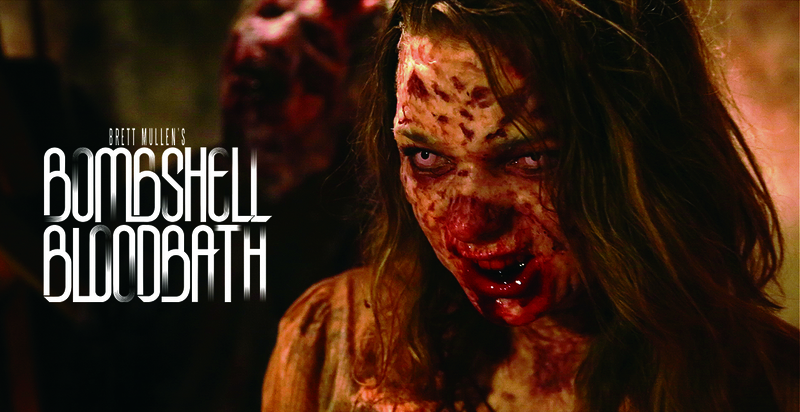 Bombshell Bloodbath is an Italian style zombie splatter feature directed by Brett Mullen. Love the title, and has zombies in it so my interest was caught. A daughter of a scientist becomes exposed to experimental treatments designed to re-animate her dead mother. As a result the girl slowly turns into a zombie. The plot sounds kinda similar to the excellent Return of the Living Dead 3 and the Facebook page has plenty of photos of great looking zombies. If this can mirror the feel of the classic zombie films of the 80's then it is sure to be a winner, I (as the blog title suggests) love zombie films so I am very interested to see how this turns out! Bombshell Bloodbath premieres later on this year. I Love zombie movies and I am excited to see this one! Brett Mullen is a brilliant director and I am excited to see what he has done with this Italian style splatter film! Don't miss out on this bloody master piece! I sure won't! I love zombie movies! Can't wait to check out this Italian style zombie splatter film. Brett Mullen is a brilliant director and I can't wait to see this bloody master piece on the big screen! I am sure we are all in for a bloody treat!